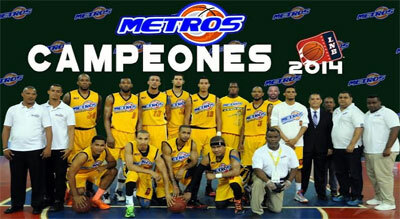 Metros celebrate LNB title. They overcame Titanes in the sixth game of the championship series to clinch the trophy. Alejandro Carmona (194-G/F-83) stepped up with 21 points to pace the visitors. Victor Liz (188-G/F-88) added 18 points for Metros and was named the MVP of the Finals. Metros jumped to a 25:16 lead after the opening quarter. Titanes pulled within one point at halftime 37:38. Titanes erased the deficit in the third term. The hosts evened things up at 60 heading into the fourth frame. But Metros capped the regulation on a 20:15 run to seal the victory. Joel Ramirez chipped in 14 points for Metros. Gerardo Suero (193-G-89, college: Albany) responded with 29 points for Titanes. James Maye (201-G/F-81, college: NC-Greensboro) was responsible for 17 points in the loss.